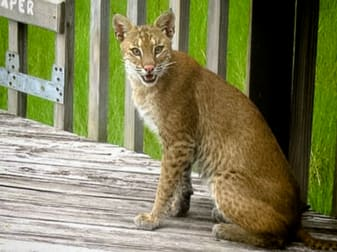 The City of Sanibel was incorporated on the premise of humans coexisting with wildlife, not only on preserved lands but also in our yards which connect to these wildlife corridors. Considering the rate of development in Florida, it becomes more important that our home landscapes are viewed as wildlife habitat. Planting native plants in our landscapes to support our native birds and butterflies or installing nest boxes for cavity nesting birds like screech owls or great crested flycatchers is rewarding and easy to do in our landscapes. The City of Sanibel supports by code a landscape that is 75% native. Please visit the SCCF Native Landscapes and Garden Center at the Bailey Homestead Preserve or check the calendar to attend a scheduled program. More challenging is living with alligators in neighborhood lakes. Learning to live safely with these fascinating reptiles ensures our safety and their survival while protecting the bird rookeries. Alligators are the protectors of the bird rookeries, eating critters like racoons that climb trees to eat the eggs and chicks. Click here for more information on living with alligators. To protect our rat eating eagles, hawks, owls, and bobcats, SCCF applauds homeowners who do not use rat poisons. Let’s bring back our nesting barn and great horned owls. Please click here to read more about acceptable and unacceptable rat poisons.